Accomplish your goal of providing your baby with the most comfy and safe sleep environment possible by getting the Kalani Mini Crib by DaVinci for the nursery. Crafted with safety features such as: adjustable mattress support that you can lower as baby grows, non-toxic finish and stationary rails, this baby bed is sure to keep your precious angel safe from bedtime till morning. This mini crib is also quite beautiful, with rounded edges and quality craftsmanship that are all enhanced by the rustic, Honey Oak finish. 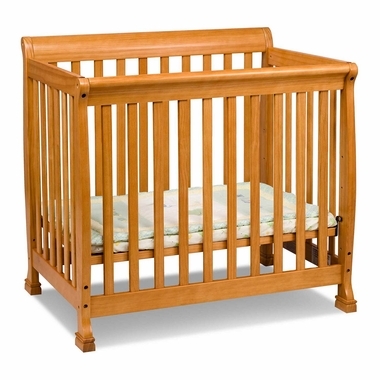 The solid pine construction will ensure that this crib remains strong through all of your baby's tossing and turning and it will be sturdy in later years when you convert it to a twin size bed with the use of conversion rails. (conversion rails sold separately) With this crib in your baby's nursery, you can rest assured your little angel will sleep well and safely and the nursery will remain beautiful for years.